Living Health has a rating of 4.9 stars based on 17 reviews. Living Health is a 7-day health program focused on renewing your energy and vitality at a cellular level. 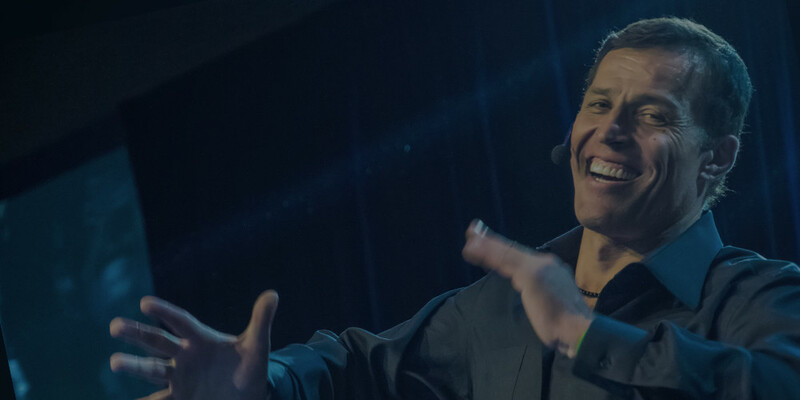 Discover the foundational nutritional principles that Tony Robbins has mastered in order to maintain control of his health, energy and emotions and keep them at a peak level every day. Explore each factor that affects your energy level, including how an alkaline diet reduces susceptibility to disease and creates balance in your body. After completing this program, you will have everything you need to achieve and maintain a healthy, high-performance lifestyle. "The higher your energy level, the better you feel, and the more you will use your talent to produce outstanding results." 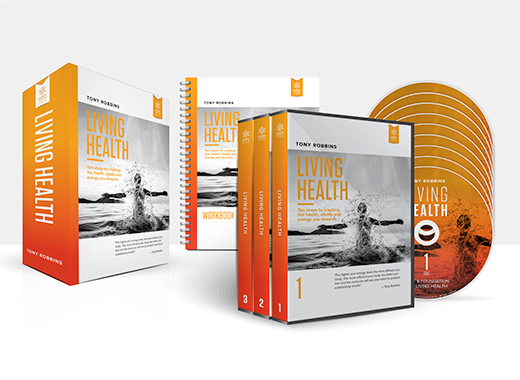 The complete Living Health audio CD set. Custom workbook/reference guide; complete with compelling health insights and statistics. Portable summary cards; designed to help you integrate the principles you learn into your daily life. Bonus PowerTalk CD — featuring Tony in interview with Robert Young; pioneer and leading cellular health expert, who shares how to impact the biochemistry of your body while improving and lengthening the lives of your cells. Eliminate daily fatigue and transform your health to feel more energetic everyday. What if you could wake up every morning filled with youthful energy – and maintain that same level of energy all day long? Most of us live in a constant state of fatigue, where even running errands, working out or maintaining a healthy lifestyle all seem too challenging. Our energy affects everything we do, which is why Tony spent years studying ways to create and maintain a level of energy that would enable people to not just survive each day, but to truly thrive. In this program, Tony Robbins guides you through a 7-day process that, when implemented correctly, has the power to transform the way you experience every day of your life. The first step is understanding how energy directly impacts not only your physical health, but your emotional state.Then discover the key to a healthy gut and why that is essential as a building block for lasting health. Finally, you will learn the 6 Gifts (to embrace) and the 4 Poisons (to avoid) and embark on Tony’s 7-day challenge for a complete and lasting transformation of your health. After 7 days, experience a new sense of accomplishment as you start and finish your day with renewed energy. Imagine what you could achieve in your life and health if you didn’t constantly feel tired? Find out with this risk-free opportunity today! 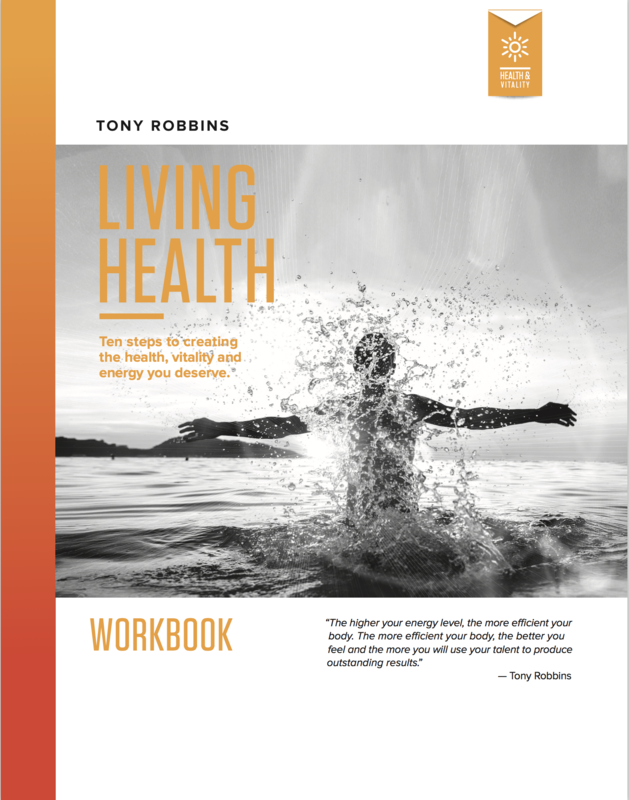 An introduction to Tony’s 10 Principles of Living Health, why diets don’t work and the key to feeling energized. Discover the cycle of imbalance and how an alkaline-focused diet will keep your gut healthy. Learn the 6 gifts that will create health, vitality, energy, fitness and endurance in your life. Now that you’ve learned the 6 gifts, it’s time to eliminate the 4 poisons preventing you from a healthy life. Transform your energy by partaking in Tony's 10-day challenge. I really enjoyed the Living Health program. I would suggest that better online resources are established to support people who have purchased the program. This online resource could tell people where they can purchase the various products discussed. For example, I'm based in Australia and I haven't been able to find the green drink discussed. Don’t have a CD player? Want flexibility and access to the program, at all times? With Living Health on the Breakthrough app, you will be able to access all 10+ hours of Tony Robbins audio content, on the go, through a mobile application. Fumbling with your mobile apps? Do you prefer listening to CDs? If yes, this is the version for YOU! Imagine inserting your Living Health CD, pressing play and learning how to begin living healthy so you can start to truly live and enjoy the rest of your life! Moreover, the audio quality is great. After purchasing Living Health, you will receive an email with your access information. In the email, you will receive a link to download the mobile application, Breakthrough. The app is available in the Apple App Store and Google Play Store. In addition, you’ll receive access to all the resources for the program, within the welcome email. Already have the app? No problem, simply refresh your product list or sign-out and log back in to gain access to your newly purchased product! Living Health will arrive in a box that contains, your CD and DVD program, bonus content and personal journal.